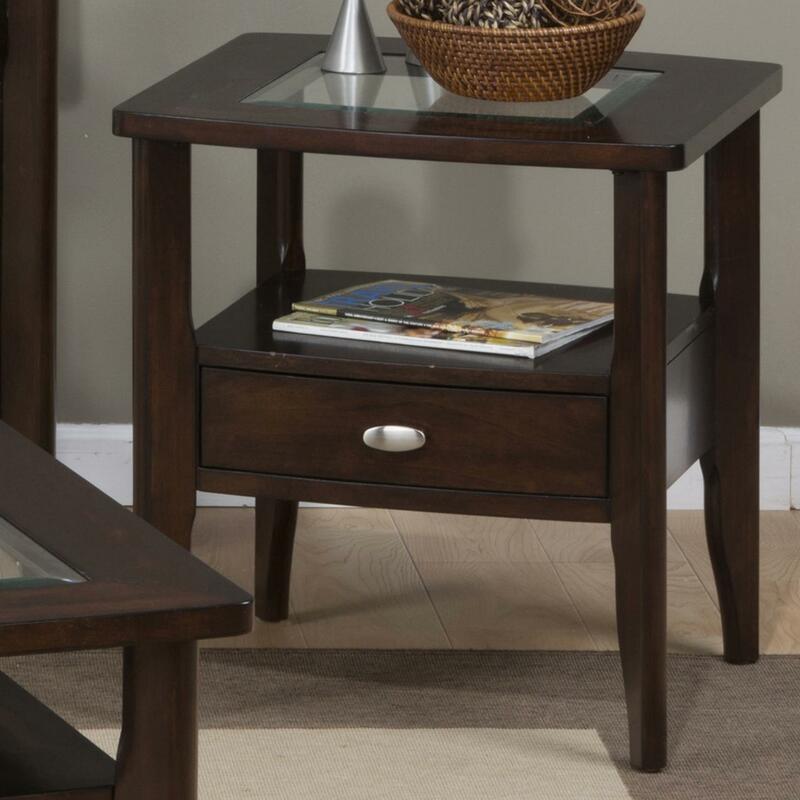 This sleek contemporary end table offers a versatile look that will fit nicely into any home. A rich dark finish washes over this clean and simple table. An inset glass top sits above a small storage drawer and shelf for displaying accent items. Smooth oval shaped hardware accents the front of the drawer for the perfect finishing touch. The Montego Merlot End Table by Jofran at HomeWorld Furniture in the Hawaii, Oahu, Hilo, Kona, Maui area. Product availability may vary. Contact us for the most current availability on this product. Handles & Hardware Silver toned hardware in a simple knob style. Case Detail Simple rounded legs on all items with casters on some and smoothly curved edges on table tops. Storage One small drawer with compartment shelf above. Description: Top Smooth finished tops with glass inserts. Case Construction Made of solid Asian hardwood and birch veneers in a retro-mod design style. This sleek contemporary collection offers both style and function for your living room or family room. 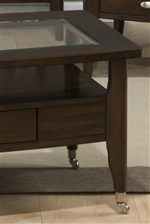 Montego Merlot features clean lines and inset glass table tops. Simple silver tone hardware adorns each drawer front for a sophisticated touch on these accent tables. The Montego Merlot collection is a great option if you are looking for Contemporary furniture in the Hawaii, Oahu, Hilo, Kona, Maui area. Browse other items in the Montego Merlot collection from HomeWorld Furniture in the Hawaii, Oahu, Hilo, Kona, Maui area.